The Djellouli family has provided Sfax with a number of its governors over the years, particularly during the 1700s and 1800s. 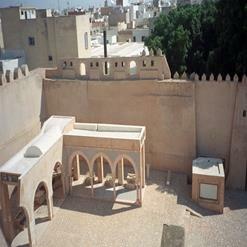 Dar Djellouli is also referred to as the Governor's Mansion, and is an example of traditional Medina architecture. It is built around a courtyard that is open to the sky, with two floors of balconies on four sides looking down on it. The rooms open onto these balconies, and house cultural items from the 1800s and even earlier.